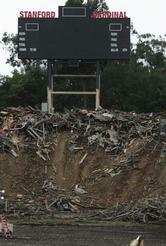 The football stadium at Stanford Stadium is a huge, funky, dumpy relic. Built in 1921 with an enormous capacity of 85,000 people, the stadium has seen better days. The "seats" (benches) are small and uncomfortable, there are too many stairs that limit access, and too few bathrooms: Super Bowl XIX was held there, and I'll never forget the sight of dozens of men peeing over the upper stadium railing into the brush because they couldn't wait in line any longer. So the powers that be have decided to blow the place up and rebuild it. They're going to build a fresh new place that's scheduled, amazingly, to be ready in time for the first game next fall. The new stadium will be much smaller (50,000 seats), which better matches current demand for tickets, and will move the seats much closer to the field. And, no doubt there will be more bathrooms. Anybody who has made the drive on I-5 between the SF Bay Area and LA knows about Harris Ranch, rising like an oasis roughly halfway between the two areas. We've been stopping there for years, but only last week did I actually order a (pricey) steak at the restaurant, and it was kind of blah, not very well seasoned and not so tasty. I'm not sure what the problem was. Is Harris Ranch a sham? Does the restaurant there not serve the good stuff? Or was it the kitchen's fault? Harris Ranch aficionados, please help me out here. Don't you dare try opening a grocery store on Thanksgiving in Massachusetts. After all, that would "harm consumers". If you're buying your first Mac, here's an easy, inexpensive way to get some help. And if you're already a Mac person and you have friends or relatives making the switch, get them a copy and you might just reduce your personal support burden. A woman in Virginia robs banks while talking on her cell phone. How rude! People who have read my ancient Mac programming books assume I'm some hotshot programmer. But I'm not -- I'm a writer, and I'm the world's slowest programmer. Most of the programs I've written are tiny examples that help me understand the way some language or toolkit feature works, but don't do anything practical. Recently I was reading an old magazine and I came upon a programming puzzle in a Google employment ad. I wanted to try writing code to solve the puzzle. My most recent programming experience is with Cocoa via Objective-C. But I'm rusty with that, and besides, I don't think it's the greatest environment for whipping up very small programs, because every program requires a lot of boilerplate to get it going. So I realized that I don't really have a language I can use for quickie programs, and now I'm looking for one. I need one that's suitable for tiny projects and fits my self-taught semi-programmer's brain (which means it has to be reasonably accessible). An interactive shell would be a great bonus, and so would the abililty to use Cocoa. I'm thinking of Ruby or Python. Anybody have an opinion? RPS-25 is an insanely obsessive expansion of the classic game of Rock, Paper, Scissors (or Rochambeau). 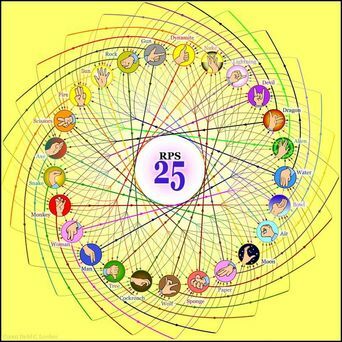 In RPS-25, there are not just 3, but 25 different gestures, resulting in 300 different non-tie outcomes. It has become a favorite game in our house. "Hah! Alien destroys sun!"